This FortéEMR 3.0 is 2014 Edition is compliant and has been certified by an ONC-ACB in accordance with the applicable certification criteria adopted by the Secretary of the U.S. Department of Health and Human Services. This certification does not represent an endorsement by the U.S. Department of Health and Human Services. FortéEMR is an EMR application that is sold as a one-time purchase with one provider license included. An additional license cost will be applied for any providers beyond the first. There are no other fees required to keep the original license active. The one-time purchase includes the software license, initial training and technical support. 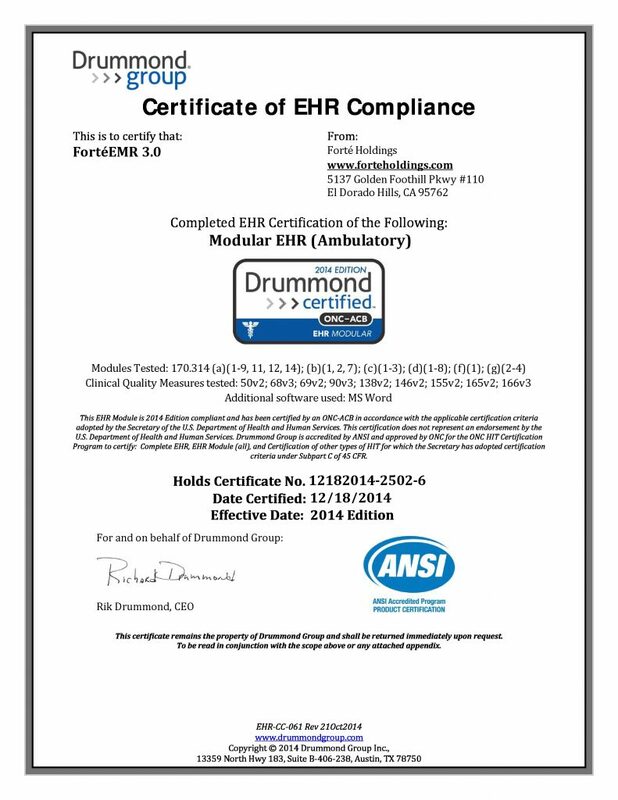 The EMR allows users to send and receive Direct-based messages to/from other users of certified health IT systems. Direct messages may include clinical data, notes, and other information, subject to the limitations noted. Our Direct offerings support related Meaningful Use and ONC requirements for sending and receiving transitions of care summary documents. There are no additional contractual or technical/practical limitations. This certified product-version will include all updates for that certified product-version free of charge. Any future certified product-versions may require a nominal upgrade fee in order for the end-user to maintain compliance. No additional contractual or technical/practical limitations. 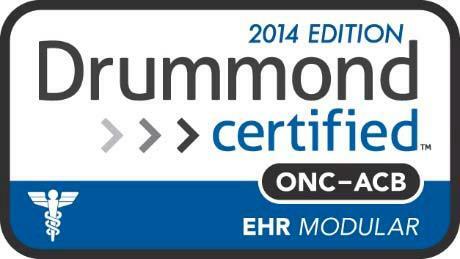 This certified product-version may require annual costs for clients who wish to e-prescribe within the application. Should a provider wish to establish a new e-prescribe account they will need to contact Forté Holdings and we will provide them with the cost We have an exclusive relationship with DoseSpot and they are the sole provider of e-prescribe integration. This certified product-version does not require any on-going support or maintenance to utilize the application. Furthermore, a limited amount of training sessions on the certified product-version are included with purchase. If a client wishes to have technical support or further training on the product, technical support and training are available for purchase. For our full disclosure report please click here. Click here to view the full size certificate. You will be leaving the Chiro8000 website and continuing on to a third party site. Click here to access the CHPL Government website.